Irish Crystal vase is a 12" tall rounded rim design that is cut by Galway in the Longford pattern. This Irish crystal vase is a classic round rim design that is cut in the Longford motif. The Longford vase features a cut design that extends all around; it stands 12" tall. The Galway Crystal vase is made of 24% leaded crystal; it is gift boxed, complements of The Irish Gift House. Irish Crystal vase is a 10" tall rounded top design that is cut by Galway in the Longford pattern. 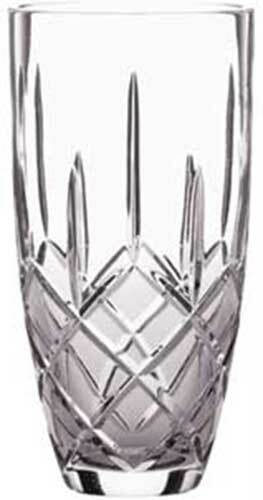 Irish Crystal vase is 12" tall footed design that is cut by Galway in the Longford pattern. Irish Crystal vase is 10" tall footed design that is cut by Galway in the Longford pattern.